“The Rent Is Too Damn High,” Grace C.
Rent control in California was dealt a major blow in the November 6th midterm election when two-thirds of voters defeated Proposition 10, a ballot referendum that would have repealed the state’s 23-year-old law that severely curtails the ability of municipalities to regulate residential rents. This 30-point defeat came in a state where two out of three respondents in a statewide poll before the election said that housing affordability was a big problem and where renters need to make $32.68 an hour (California’s minimum wage is $11/hour) to afford a two-bedroom rental home without spending more than 30 percent of their income on housing costs. Certainly, some (or much) of Prop 10’s lopsided defeat can be tied to campaign spending. Its proponents, a coalition that included unions and environmental organizations, raised more than $25 million to pass the measure. They argued that expanding rent control would protect tenants, that too many families are forced to move far away from their jobs and even into homelessness, and that with every five percent increase in rent, 2000 people are forced out of their homes. Furthermore, they said, Prop 10 gives local governments the flexibility to decide if regulating rents make sense for their situation, rather than forcing one solution on all. Finally, the pro camp noted that this measure still allows landlords to make reasonable annual increases in rents. The opposing side—Wall Street firms and real-estate giants like Blackstone, Essex Property Trust, and Equity Residential that lined up behind the California Apartment Association—amassed more than $74 million to defeat Prop 10. With ads in English and Spanish, Prop 10’s opponents argued that enabling localities to enact rent control laws would drive up rents and hurt seniors, veterans, and other lower-income populations. Renters would be forced out by corporate landlords choosing to turn apartments into condos and vacation rentals, and bureaucrats would be giving unlimited powers to add fees to housing. 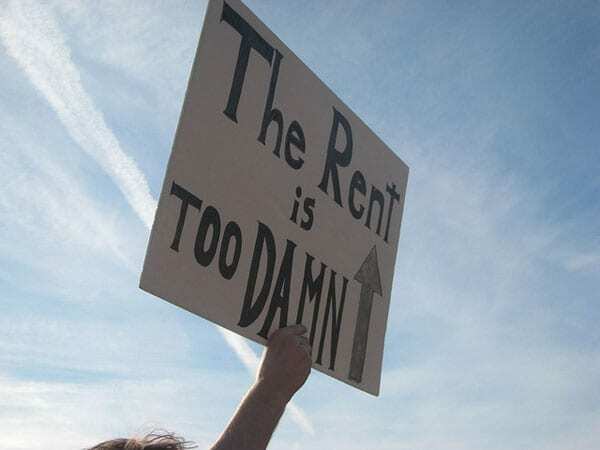 What does the research say about the real impacts of rent control? The evidence is mixed and one’s takeaway depends on ideology and self-interest. A literature review prepared for the National Multifamily Housing Council (the apartment industry trade association) that covered studies published between 1972 and 2017 concluded that rent control and rent stabilization policies do a poor job at targeting benefits to low-income families (higher-income families benefit as well); that because residents of rent-controlled units move less often, it can cause them to live in housing that is the wrong size and/or in the wrong location to best meet their needs; that rent control leads to a reduction in the available supply of rental housing in a community (particularly because of conversion to condos or other ownership forms); that they generally lead to higher rents in the uncontrolled market; and that there are significant fiscal costs for the administering entity. They have little negative impact on new construction but may lead landlords to reduce maintenance or remove units from the rental market through conversion into condos or owner move-ins. Renters in the controlled or impacted units experience real gains in welfare due to rent increases lags. Removing rent regulations leads to rent increases in both controlled and non-controlled units in a community (most likely due to displacement from gentrification). Rent regulations promoted housing stability for rent control beneficiaries but these benefits were offset by decreases in the number of available units. In summary, the USC study concludes that “the current evidence cannot answer all the questions swirling about rent regulations,” but that there are some tangible benefits and fewer negative impacts than are often presented. More research is needed about the impacts of rent controls on small landlords and the net impact on local businesses when residents have more disposable income. The issue of the efficacy—or not—of rent control is not just critical for California. Since 1990, our nation has lost over 2.5 million housing units that rent for less than $800 a month, with nearly half of 43 million renting households paying more than 30 percent of their income on rent, with 11 million spending more than 50 percent. Rent control is a live political issue in Illinois, where residents in three Chicago wards passed resolutions calling on Illinois legislators to rescind that state’s long-standing ban on rent control, and in New York State where tenant advocates intend to pressure the new, now Democrat-dominated legislature to expand New York City’s rent control regulations to the entire state. In Washington state, though a bill earlier this year to repeal the ban on rent control never made it out of committee, advocates see a renewed interest with a new Democratic majority in both houses of the legislature.